As a local business owner, it's not enough for your website to be listed in Google's natural search results. It must also show up in Google's business listings which are available through Search, Maps and Google+. My friend Jo Gagné recently asked for my help to increase traffic to her business website, BodiesonPower.com (BOP). 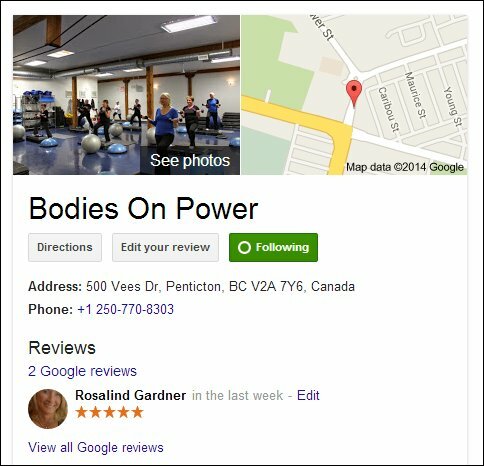 Bodies on Power is an award-winning fitness center here in Penticton, British Columbia. That's right – nothing in the local business listings. While her site did show up in the natural listings, I had to scroll well past the initial fold to find it. That's not a good place to be when her major competitors all had their businesses properly listed on Google. So, I set her up with a Google My Business listing in less than half an hour. Here's what I did. Through her Google account, I created a Google+ personal profile page for Jo. I went to Google My Business (US) (Canada) to set up the listing for her studio. I created her Google+ Business page by entering the name of her business, address, telephone number and hours of operation. I also uploaded profile, background and other pictures. I verified the listing using the phone method. I alerted the studio that they would be receiving a call from Google with a set of numbers they would need to record and pass back to me. I entered the verification number the studio gave me and the listing was finalized. That took me just short of an hour to complete. 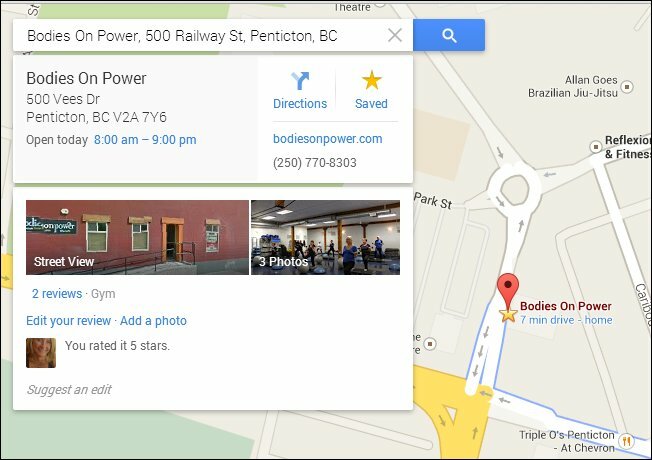 Shortly afterwards, the Bodies on Power website showed up in the local search and business listings on Google. 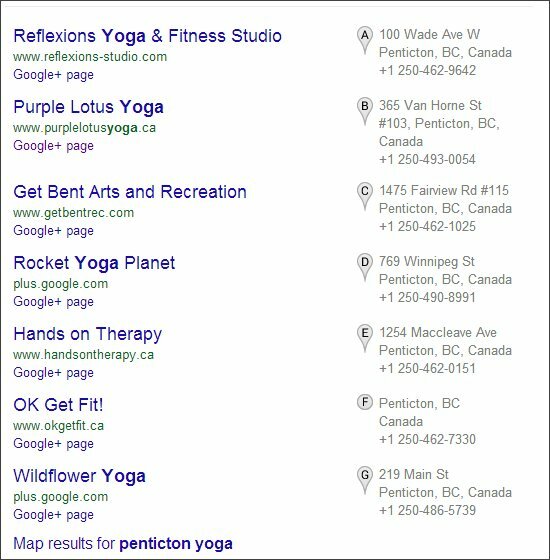 Now, when I search for “Penticton yoga”, Bodies on Power at least shows above the fold. YAY! It also shows up on the Google Map. 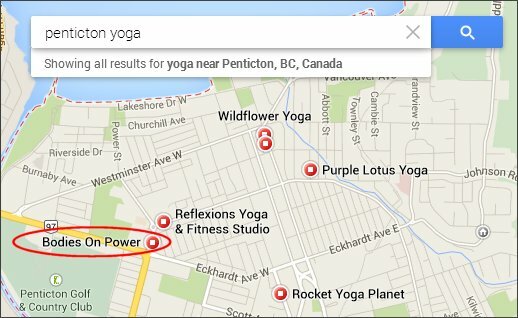 Showing up on Google Maps is very useful, especially in a resort town such as Penticton where our population quadruples in summer and there are no doubt plenty of visitors who would want to drop in to a fitness class. 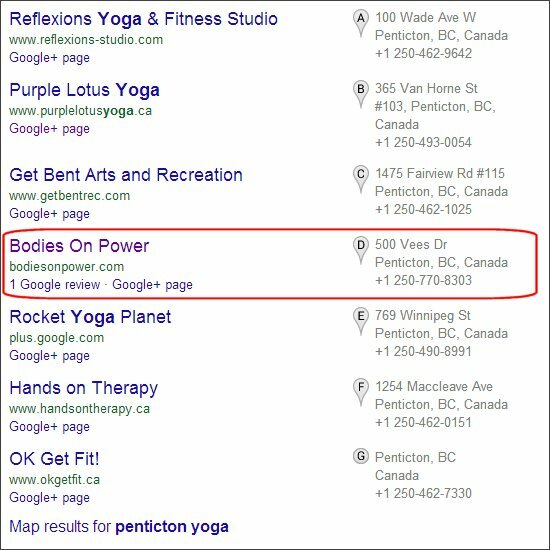 Better still, the Bodies on Power listing in natural search now includes a ‘local listing indicator' which appears alongside the business address and phone number, as well as links to Google Reviews and the Google+ page. Last but not least, Jo's business now has a pretty Google+ profile that shows up beside her natural search listing. The beauty of this is that for those of us who use Google Maps, directions to the place of business are just a click away. So… now all we have to do is get Jo's webmaster to install a Google +1 button so her visitors can/will leave reviews, endorse the Bodies on Power content, and re-share Jo's Google+ posts across the web. I so agree with your remark in comments per reviews. Amazon employs this to very useful effect, no doubt. I am wondering whether there are any automated means of effectively copying reviews from other sites and having them appear on a business’ G+ page? In several niches there are directory sites where a business’ customers can leave reviews. Is there some way to automatically link these to the business’ G+ page? Thanks for the information. However, I was wondering if you could write something on how to improve Google SEO ranking for affiliate products promotion websites. SEO for affiliate sites is pretty much the same as for any other site. You might want to have a look at this page. Puting your business on google+ and maps will help a lot..
Now that is what I call a really useful piece of information – thank you. I set this site up for a friend several days ago. It comes up with a organic search, but I would like to include a better business search facility. I will be utilizing the information in your post, however I am always open to more ideas. Hi Ros, and thanks for the tips. Getting a good Google ranking is so important, whether for direct business & sales or for profile and credibility. I notice you have mentioned you posted a review. Do you think this is an important factor in achieving visibility? We have all the other steps covered but have never really gone looking for reviews. I would be really interested to know if this has made a difference for other businesses. We rank fairly well but we could always do with some more help, particularly for the more generic key words. I tend to think like a potential customer. If I see that a business has 15 Google reviews and a rating of 4 or 5, I’m more likely to visit their website before I visit one with no reviews at all.